Newspaper WordPress themes are powerful themes that allow you to turn a typical WordPress blog into fully-fledged news site, magazine site or content machine. They’re themes designed to host multi-category content on the homepage, and many come with homepage demos designed to display your content in a hierarchy you can use to organize stories based on popularity or relevancy. Newspaper WordPress themes are meant to suit a specific niche. They’re meant to support sites that publish several pieces of content everyday in several different categories. They’re also meant to support sites that receive a lot of traffic from a typically highly-engaged audience and require multiple sources of revenue. Therefore, these WordPress themes for professional editorial websites must have a specific set of features and options. Let’s talk about them. For starters, newspaper WordPress themes must have well-organized homepages with structures that make sense. Readers are going to come to your site looking for the latest news or the hottest and most relevant stories. If you structure your homepage in a form that’s typical for a blog, such as list form, you’ll only frustrate your audience and increase your bounce rate. Customization – This mainly means the ability to pick from multiple layout variations as well as a wide set of options in the live theme customizer. User Friendly – This means the particular WordPress theme was built with speed in mind, and it’s even optimized for mobile devices. A fully responsive layout is a must nowadays. Custom Headers – This allows you to build custom navigation menus, use your own logo, use news tickers and more. As a result, your site will look more unique to establish your brand. While running a professional news publishing business you need more advanced features which you usually won’t find in regular blog themes. That’s what makes magazine and news WordPress themes stand out. Let’s talk about a few newspaper WordPress themes that fit this criteria. 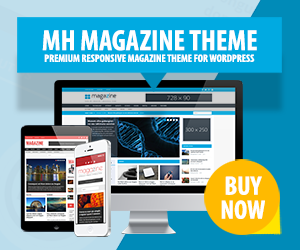 MH Magazine is our very own newspaper WordPress theme. This is one of the most popular WordPress magazine themes on the market. The homepage of this news template is based on widgets and uses a hierarchy that gives you the power to organize your content based on importance. This popular news theme also comes with a number of different flexible options that allow you to choose your own layout and styles to truly make this WordPress theme your own. You'll also enjoy the ability to use a variety of different ad spots, custom menus and custom widgets. Newspaper is the best selling news and magazine WordPress theme, with over 65,000 sales on the ThemeForest market. It includes over 50 beautiful pre-built demos and even has its own separate mobile theme optimized for speed. The Newspaper theme is powered by tagDiv Composer, a frontend page builder. Specially created for the news and publishing industry. The tagDiv Composer builder allows you to drag & drop over 100 handcrafted elements to create amazing pages. The latest version comes with the tagDiv Cloud Library and 420+ pre-built templates for posts and pages, that can be imported with a click and customized on the frontend of your website. With Newspaper, it’s easy to customize everything starting from headers, footers, ads, translations to category templates and social networks. This highly optimized and fast WordPress template also uses an intelligent ad system and is Google AdSense ready. SEO friendly and AMP ready. Newsmag is a premium newspaper WordPress theme developed by tagDiv to fit into any blog, news or magazine website. It features a stunning, responsive design and ensures a great user experience on any small screen device. The Newsmag theme comes with various homepage demos, beautiful post styles, ready to load translations, premium plugins and widgets. With the frontend page builder, custom blocks and customizable features, Newsmag is a great choice for any fashion, music, personal, magazine or news related website. The Fox is a magazine and newspaper WordPress theme that uses a modern take on a classic style the newspaper industry has used for centuries. It's a WordPress theme designed for content-heavy sites as it allows you to use multiple blog layouts. You can even create your own look using the 100 custom options available in the live theme customizer. You can also choose a different layout for each individual category. What makes The Fox stand out is its truly unique layout and design. Bimber is a magazine theme designed for sites that create viral content similar to BuzzFeed, but it comes with enough features and flexibility to be used as a newspaper theme for entertainment news sites. The Bimber WordPress theme features a sleek, modern design and comes with numerous homepage layouts, page and post templates, and header layouts. MH Newsdesk is another newspaper WordPress theme from MH Themes. This one features a much simpler layout in comparison to MH Magazine designed for sites with less content than a dedicated news organization but more content than a typical blog. It also allows you to choose your own layout for archives, customize a variety of different features, including colors, fonts, and more, and enjoy the security of a theme that takes speed and SEO very seriously. Prime News is a modern WordPress theme by WPZOOM. The theme is especially suitable for professional news & magazine websites. You can showcase content from different topics and genres by taking advantage of the multiple unique sections on the front page. Prime News is fully responsive and comes with everyhing you need to run a news or magazine site. Domino Magazine is a beautiful magazine and news theme available for WordPress. This theme has an elegant design, is multifunctional and highly customizable. You can take advantage of multiple unique widgets to build your front page and showcase high-quality content. In addition to its beautiful spacious layout, Domino Magazine of course is mobile-ready and fully responsive. SmartMag is a magazine theme that's modern and versatile enough to be used as a newspaper WordPress theme. It comes with multiple homepage demos that allow you to choose the layout and style that works best for you. It also comes with a drag-and-drop page builder you can use to truly customize the layout and look of your site. You can even pick from several different menu styles. NewsCore is a newspaper theme designed for content-heavy sites that deal with current events in different niches. It comes with four demos and 17 homepage variations, and it's designed to work with a wide range of devices and screen sizes. It also comes with a layout builder you can use for custom layouts. Entertainment sites can even add reviews to their content marketing calendars with the built-in review system. With NewsCore you can take your news or magazine site to the next level. GoodLife is another magazine theme that doubles as a newspaper WordPress theme. It comes with a collection of demos, each of which is designed for a different niche, including general news, sports, gaming, tech, lifestyle and more. In addition it also comes with several well-designed layouts for pages, separate layouts for gallery and video pages, three header styles, and a quiz builder. Soledad is one of the best-selling blog and magazine themes, but like the other magazine themes on this list, it can also be used as a newspaper theme. This theme comes with an unlimited number of custom styles you can use, so much so that you can create over 900 homepage designs. This includes over 300 options available for use in the live theme customizer. You can even use the drag-and-drop page builder it comes with if you don't want to use the live theme customizer. Gonzo is a magazine and newspaper WordPress theme designed for entertainment sites, including news sites for the film, TV and gaming industries. It comes with flexible layout options that allow you to control the way your latest and greatest content gets displayed on the homepage. It also comes with a review system you can use to review the latest films, TV show episodes and games with visual representations of your scores. Therefore, with Gonzo you can create modern and vivid news sites. Extra is a dedicated magazine theme by Elegant Themes that's versatile enough to be used as a newspaper theme. It comes with the Divi Builder page builder plugin, giving you the ability to create your own custom layouts to organize your content based on importance or category. Overall, it uses modern and sleek styles with vibrant colors. As a result, Extra is a great template for news sites. Nexus is another magazine theme by Elegant Themes that can be used as a newspaper WordPress theme. This one is not powered by the Divi Builder, though it is compatible with it, and it uses a much simpler style than Extra uses. However, it's still a great theme and comes with enough features for it to be used by news sites that publish less frequently than dedicated media organizations but more frequently than blogs do. Therefore, Nexus can be a great choice for your publishing business. Hello! A big thanks for this great WordPress theme collection. Awesome list. Really helpful and appreciated.